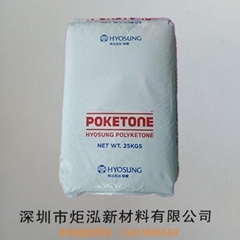 Shenzhen Ju Hong new material Co., Ltd. is the only agent in Southern China District of POK, Korea (POKETONE). Distribution Sinopec PBT, PETG, TPEE. Best-selling end-factory users, enjoy a high status in the industry, the company with a number of retailers and agents to establish a long-term stable cooperative relations. In addition, the company developed PC+ polyester based on the basic GE formula, PC/PBT, PC/PET, cold resistant PC, cold resistant and flame retardant PC, halogen free and flame retardant PP, glass fiber reinforced flame retardant PET and other engineering plastics to the market. The other alloy modification is our speciality, and in Shenzhen, Dongguan, Zhongshan, respectively. Warehouses with full stock for a long time. The company has professional technology development team, sales team and after-sales service team. With good service and mature, professional technology for the customer to solve the product selection, material and production process problems, the company is strong, heavy credit, keep the contract, guarantee the quality of the product, multi variety management characteristics and customer based principle, won the trust of the majority of customers.